To emulate real-world usage scenarios, we record system-wide mains power draw both when idle and while playing Grand Theft Auto V.
To emulate real-world usage scenarios, we record GPU core temperature both when idle and while playing Grand Theft Auto V.
A PCE-318 meter is used to record noise levels when idle and while playing Grand Theft Auto V.
Maintaining out-the-box voltage, we increase the card's power target and aim for an optimal balance of core and memory overclock. With the heightened frequencies in place, the 3DMark, Grand Theft Auto V and The Witcher 3: Wild Hunt tests are re-run at QHD settings. To minimise the impact of any CPU bottlenecks, our test platform is configured with a quad-core Intel Core i7-4770K processor overclocked at up to 4.4GHz and 16GB of Corsair Vengeance Pro DDR3 memory set to run at 1,866MHz using the built-in XMP profile. For our midrange benchmark suite, we have an array of games tested at FHD (1,920x1,080) and QHD (2,560x1,440) resolutions. Where applicable, any vendor-specific enhancements such as PhysX and TressFX are disabled to help even the playing field. 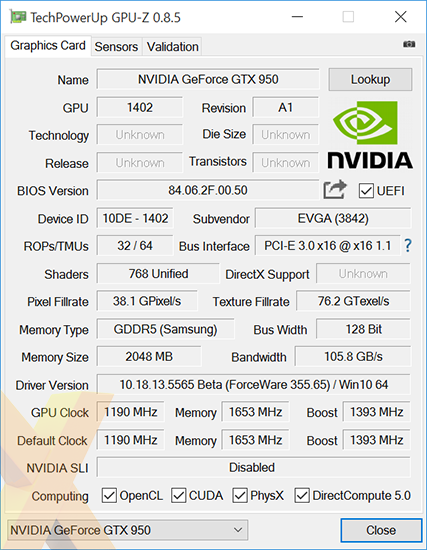 In-game benchmark results are recorded as minimum and average frames per second.